I have been tagged by @kateab to answer the 10 question meme that is dun dun dun…. 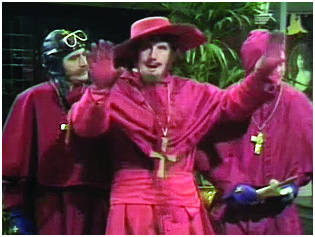 Or, as Kate dubbed it – The Spanish Inquisition! Robert Webb. I’d like to go to a bar in Brighton called something like Etsa/Esca in Preston Street. Hmm just looked it up and it seems to now be called Oxygen Red so I’m not sure if it has the same atmos as the old place, assuming it does though we would go there. And we would talk about whatever he liked! Fingers crossed David Mitchell would swing by, swiftly followed by Russell Howard, Ed Bryne, Dara O’Brien and Punt & Denis! 2. What is the best gift someone could give you (tangible please)? A house. …oh right, back in the real world huh. I would like to live in NYC. I would like to live somewhere peaceful and rural but within walking distance of a town. I would like to live in Portugal. I would like to live somewhere that is cool (but not cold) all year. I do like living where I live now, I just hope they don’t develop it much more as it is starting to spoil it. I love cooking things I haven’t cooked before, I like the excitement of it. I find that it is only ever the first time that I follow the recipe carefully, after that I get complacent and the results vary! I can make a very good lasagne though. The Five People You Meet In Heaven – I bought it in a NYC book shop purely because I liked the rough uncut feel of the way they finish their books over there. I didn’t expect much from it, it is a small book and it isn’t the type of thing I usually pick up. It tore through my soul. I’m going to waste this answer. I would go back to a nightclub in 1995 where my ex husband asks me to dance and I would say “no, not if you were the last man on earth, now sod off you poor pathetic excuse for a human being” and then, just to be sure, I would stab him, and possibly arrange for cattle to stampede on him, and then I would hop back in the tardis and feed him to a dinosaur – a proper bitey one not one of those ones with silly little arms who must have been very frustrated. Some days yes, I’d embrace it and I would sparkle and shine. I’d enjoy parties and I would relish in mixing with the beautiful people. Other days no, sod off and leave me alone. I am very indecisive, sometimes, and looking back over these I can see a million (and prone to exaggeration) different answers that I could have given and that would be just as valid. Over to you, you lovely bunch of people! Person to have dinner with: Mel Gibson, ANYWHERE. Talk? Not necessary. Tardis: not knowing what that is! I would only be famous as a writer. They get to wear sweats to the grocery, right? I adore what you would do if you had a tardis! I would do exactly the same to my ex boyfriend, but maybe more vicious! Thanks for the tag! I’ll be posting mine this week sometime!